This week I chose to get less sleep and do more quilting. That’s apparently the only way it is going to happen for me. But it is all good. I love my results! Here is the completed mini-quilt from the Kim Diehl Simple Whatnots Club. I was careful with the piecing, but I do think starching and sewing slowly made a difference in getting my points which are ALL OVER this quilt. I have even found a perfect spot for it in my home. Once quilted, I’ll lay it on top of my vintage Singer treadle machine. But that wasn’t my only finish this week! Oh no! During my lunch hour at work, I usually browse my blog lists and it was Friday afternoon when I came across a blog post from Cluck Cluck Sew and the talented Allison. Click HERE to open a window up to her blog post. THANK YOU Allison!! I used her generous, free mini quilt pattern for the center of the quilt and then added on some borders to make it big enough for a table topper on my kids activity table. I started this around 9:00 pm on Friday night… stitched the center and was done by 1:00 am. Picked up in the morning and added the polka dot inner border. I have the same polka dot print, but in a larger scale, picked out for my Snapshots picture quilt – so it was also a test to see how well it would play with that white background (which is also my main background in the Snapshots quilt). I literally just worked with fabrics I already had sitting at my finger tips on the cutting table. I had a fat quarter bundle of Milk, Sugar, & Flower by Elea Lutz and the sweet prints seemed perfect for a Valentine themed quilt. I used scraps I had sitting on my table from the Snapshots quilt, to make the pieced side borders. The smallest heart is made from the red dot print from Little Joys. And, what do you ask, about the Strawberry Fields Revisited that I raved about? I guess I still have some trepidation of opening up my perfect packages. But, baby steps! 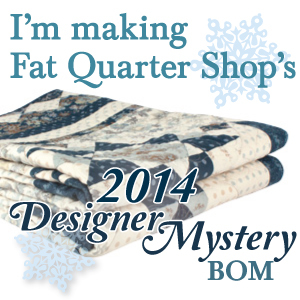 I now have my fill of precuts, fat quarter bundle, Frivol and charity Quilt Along kit in my sewing room. At some point I will order some yardage, but I need to give my credit card a break. My feet were squirming a bit when I pulled this out of the box. This is the Crossroads Quilt Along kit from Fat Quarter Shop. It is their second (hopefully annual) charity quilt project that will benefit the March of Dimes. They only ask for a $5/month donation – but the patterns will be available for free from their blog page. I just want to unpack it and roll around in the fabric and lay it out on the bed …. but it won’t breathe any fresh air in my house until it is time. Need to protect it from kids and cats. The smaller box I received was the much anticipated Moda FRIVOLS. I am not getting all of them (they are a monthly series of 7″ square cuts of fabric collections, packaged in a super cute tin and original pattern). This is my third FRIVOL purchase. But it will certainly be the first one that I actually quilt. I think I will open this one up over the weekend (maybe tonight) and start to digest the pattern instructions. Although I plan to work at least one day this weekend, I am taking Monday off from work to hang out with my kids. I bought a coupon for services at the Mad Potter. You can pick out some pieces of ready-to-paint pottery and have fun. Kids need something to give Dad for his birthday and my kids LOVE to paint. Hope you are excited about your weekend plans as well! Thanks for stopping by and I would love to hear if you are as addicted to this fabric as I am.